Rather than deleting an opportunity that isn’t going ahead, it’s better to mark it as lost or dead, or cancel it. Lost, dead, or canceled opportunities remain on your system for your reference, giving you insight into where business might be getting lost. They’re made inactive, so they’re hidden from default views. You can reinstate or clone these opportunities in future if the job is going ahead. When you know an opportunity has gone to a competitor, mark it as lost. When an opportunity has gone cold or the client is no longer interested, mark it as dead. From an opportunity page, click the Mark as lost or Mark as dead links under Actions on the details pane. The opportunity status will change from open to lost or dead. When your opportunity has progressed to an order, you can’t mark it as lost or dead. Instead, you can cancel it. To cancel an opportunity, click Cancel opportunity under Actions on the details pane. Orders can be canceled up until any products have been checked-in on it. When canceled, the opportunity status will change to canceled and this opportunity will become inactive. The easiest way to see all of your lost, dead, or canceled opportunities is to filter the view in Opportunities to see inactive opportunities. 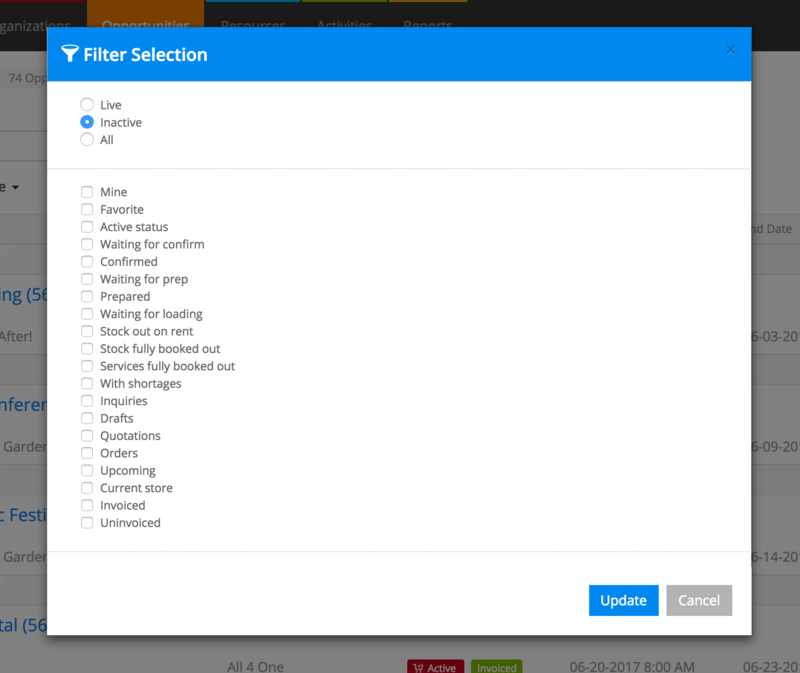 To do this, head to the main Opportunities screen and click View: Live and then choose Filter Selection from the menu. On the next screen, select “Inactive” and update the view. To view more detail, create a custom view. 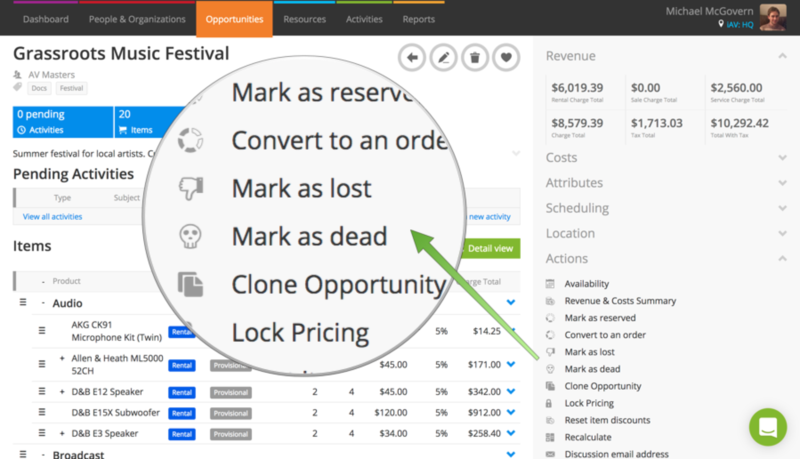 Custom views are a great way to see a list of lost, dead, or canceled opportunities over a specific period of time. Add as many criteria as you like to the view to drill down into the data. Lost or dead opportunities can be reinstated. From a lost or dead opportunity, click Reinstate opportunity under Actions on the details pane. Canceled opportunities can’t be reinstated, but you can easily re-create them by cloning the opportunity to create a copy. Just click Clone opportunity under Actions on the details pane. Your cloned opportunity will be a draft order, ready to modify before converting to a quotation or order. How can I record a cancellation reason? Discussions are a great way to store notes. Create a discussion with the subject "Cancellation notes" or something similar and add your team as participants. Use activities. When you find out that the opportunity isn’t going ahead, you can create an activity to note that you spoke to the client and that they’re canceling. Add further information to the completion note. Create your own custom field to record this information. You can! If you'd rather delete opportunities, use the trash can icon at the top of the screen. Keep in mind that when you delete opportunities, they're permanently removed from the database. You can delete an opportunity up until you've booked products and services out.